November 1, 2018 – For the past 11 years, the Royal Australian Mint has held an annual ballot for the iconic Kangaroo at Sunset $25 Gold Proof Coin, with this year marking the coin’s final release. 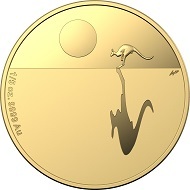 Available exclusively by ballot, the Kangaroo at Sunset $25 Gold Proof Coin release has been a yearly tradition for the Mint, says Chief Executive Officer Ross MacDiarmid. 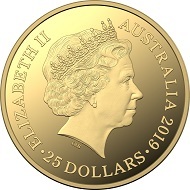 Australia / 25 dollars / gold .9999 / 1/5 oz. / 21.69 mm / Mintage: 1,000. “First struck in gold in 2007, the highly collectable Kangaroo at Sunset coin has been one of the Mint’s signature designs,” he said. “This year marks the final Kangaroo at Sunset release.” Both Australian and international customers were eligible for the ballot and those that were not registered with the Mint had until 13 August 2018 to do so. The ballot closes on 24 September 2018 and will be drawn on 27 September 2018. With the conclusion of the Kangaroo at Sunset series, the Mint has big plans for a new ballot next year, with details to be announced soon. More information on this coin and all other releases by the RAM are available online. The Royal Australian Mint is also celebrating 25 years of its iconic Kangaroo Series this year. You can find an overview of the various forms and themes on CoinsWeekly. This National Geographic documentary will tell you everything you need to know about this beautiful animal.